ATCO is a diversified company providing services and business solutions globally. The company provides integrated solutions in structures & logistics, electricity, pipelines & liquids, commercial real estate and retail energy. The company is Alberta’s largest natural gas distribution company, serving approximately 1.2 million customers in nearly 300 communities. ATCO has manufacturing facilities in Canada, the US, Chile and Australia. The company serves more than two million customers in over 100 countries around the world. ATCO owns an impressive asset base comprising of 21 power plants with a generation capacity of 2500+ MW, 87,000 km electric power lines, huge hydrocarbon storage capacity, 64,500 km natural gas pipelines etc. Its regulated earnings has doubled to 93% in 2017 from 45% in 2012. In the third quarter of 2018, ATCO reorganized its operating segments into Canadian Utilities (electricity, pipelines & liquids, and corporate) which accounted for 78% of total earnings (Q3’18) followed by structures & logistics (4%), Neltume Ports (1%) and corporate and others (17%). As a one-stop provider of integrated energy, housing, transportation and infrastructure solutions, ATCO offers diverse products and services across many industries. The company’s large scale and scope of operations are global in nature. Over the last seven decades of its existence, ATCO has worked in more than 100 countries and has been successful in winning the trust of millions of customers worldwide. ATCO is known for its quality of service and products, and customer satisfaction. Given its long standing experience, the company is capable of providing varied services ranging from safe and reliable delivery of natural gas and electricity, to providing modular housing and water infrastructure solutions. Large scale capital investment requirements, ownership of diversified and regulated assets, integrated solutions for customers are strong competitive advantages for ATCO. The company’s unparalleled skills in identifying customer requirements and delivering innovative solutions exceeding customer expectations provide it a competitive edge over peers. ATCO also enters into strong partnerships with government authorities and communities which account for strong and visible cash inflow. Its electric transmission and natural gas distribution are regulated businesses and the company has been successfully growing its earnings out of these businesses. ATCO’s pipeline of projects provides clear visibility for future growth. In the structures & logistics segment, the company is expanding in new global markets with long-term growth potential, lowering operating costs and increasing rental utilization. It is growing its footprint in the industrial water and storage area by making huge energy infrastructure investment in Mexico, long-term commercial agreement to provide water services commencing in 2020 and potentially developing up to 40 salt caverns for NGL and hydrocarbon storage. ATCO’s investment in Neltume Ports, a leading port operator and developer in South America, should support stability of cash flows given its consistent and growing volumes. Integrated offerings in energy, water and infrastructure products and services positions ATCO better to meet the growing demand of logistics support, housing, energy and infrastructure solutions. 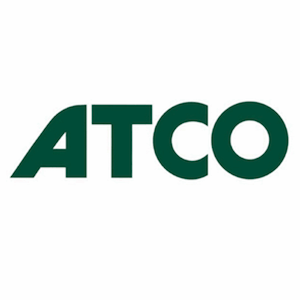 ATCO has a 26-year track record of increasing dividends, since 1993. The company last raised its dividend by 7.5%. ATCO has a decent dividend yield of 3.6% and a reasonable payout ratio of 56%. Since the last decade, the company has been compounding its dividend growth at an impressive double digit rate each year (10-year CAGR was 11.5%). Its high-quality earnings base should support its future dividend growth quite easily. ATCO’s electric and natural gas distribution business ROE stands at +3.03% and +4.23% on average respectively, over the last five years. The company is expecting its rate base to grow at 4% every year. Further, its Neltume Ports investment is expected to be accretive to earnings per share in the first full year of ownership and thereafter. ATCO provides solutions in the sectors that are fundamental to global growth and prosperity i.e. housing, real estate, energy, water, transportation and agriculture. As a diversified corporation providing innovative and comprehensive energy solutions, ATCO is favorably placed to benefit from the growing trends of industrialization and urbanization of emerging economies and other strong macro economic growth indicators. ATCO competes with several utility companies such as Fortis Inc. TSE:FTS, Brookfield Infrastructure Partners TSE:BIP.UN, Emera Inc. TSE:EMA, and Algonquin Power & Utilities TSE:AQN. Fortis is a leading Canadian utility company with assets worth $50 billion and operating through ten utility operators. About 60% of its business is in the US and the remaining 40% is from Canada. Other large competitors are Brookfield Infrastructure Partners and Canadian Utilities, which is a subsidiary of ATCO. Canadian Utilities is one of the biggest utilities in Canada, with more than 90% regulated earnings. Algonquin Power & Utilities is another diversified generation, transmission and distribution utility based in North America. ATCO is one of Canada’s premier companies with diversified businesses and a rich heritage. The company has a sound track record of growing its dividends consistently, supported by highly contracted and regulated earnings base. A strong global demand for essential infrastructure like affordable quality housing and sustainable electricity should keep supporting ATCO’s top line growth. When it comes to utilities, my take is to focus on strategic positioning of assets and holdings for growth. For now, EMA and FTS are my go to utilities due to their size and exposure to the US market. Furthermore, the subsidiary is larger by market capitalization and drives the return of the parent holding with a higher yield, why should you buy ACO.X over CU.